Manila has always been a good place to have Japanese food. Although some restaurants are “sablay”, as my friend Chinkee would say, we are spoiled for choice as compared to other cuisines. There is no dearth of yakiniku, sushi, teppanyaki, ramen and yakitori places that are quite good and not as expensive as their counterparts in other countries. As frequent travelers know, Japanese food is quite costly abroad and is considered by some to be more of a special treat rather than everyday eating out fare. Being a raw food enthusiast, sushi has always been a favorite of mine. As such, I am always on the lookout for restaurants that serve not only the freshest seafood, but also seafood that is out of the ordinary. One of my favorite places at the moment is Sushi Kappo Kobiki-cho. In my opinion, it is one of the most authentic places to have Japanese food in Manila. When I enter this restaurant, I find the atmosphere of hushed elegance very soothing, akin to entering a temple, albeit one of gustatory delights. The restaurant also takes pride in the fact that all ingredients are flown in fresh weekly from Japan, so as to ensure that diners always have the best of what is seasonally available. One evening, I asked two of my foodie friends, Sunray and Andrew, to join me for a Kaiseki Dinner (P5000 per person) at Sushi Kappo. Personable and engaging Executive Chef Yusuke Hino was there to take care of us. We were also very fortunate to have owners, Mr. and Mrs. Aoki, around to explain the finer points of our courses to us. Kaiseki is a traditional Japanese degustation meal that has been leveled to almost an art form. Much care is exercised to ensure the amalgamation of beauty, simplicity and taste of all the dishes presented to the diner. What I love about having kaiseki is the element of surprise that comes with the anticipation of what the next dish will be. There is no list and courses normally depend on what is available on that particular day. So you never know what will come next. For our first course, we had Tsubugai or Japanese sea whelk/snail simmered in a light soy sauce from the waters off Osaka. Taste and texture is very similar to regular snails with the exception of a briny aftertaste. This was definitely a delicious start to the meal. Next, we had Mame-Aji or fried horse mackerel marinated in a broth of Japanese vinegar. Horse mackerel is not unlike our local sardines in taste except that, when prepared in this way, the flavors are more pronounced than usual. I for one am not a big fan of this dish, as I still prefer my seafood raw. An exquisitely prepared Fried Shao Mai containing fresh kani or crabmeat followed. This dish is a good example of how a dish does not have to be complicated for it to be delicious. All you need is the right ingredients and proper technique. In this case, the flavor of the crabmeat stood out: clean without the greasy aftertaste normally associated with fried food. I could eat a whole tray of these babies in a blink of an eye. 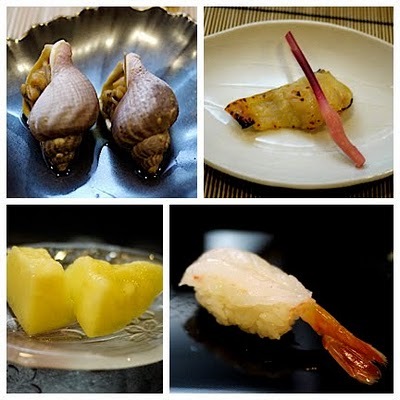 After the fried shao mai, we were each served a platter of sashimi containing exquisite pieces of Toro or the fatty portion of the Blue Fin Tuna belly; Suzuki or Japanese Sea Bass; Akagai or the meaty Japanese Arc Shell and the star of this course: Kuruma Ebi or Japanese Imperial Prawn. The Kuruma ebi was so fresh that when I bit into its sweet, sweet flesh I could still feel movement caused by the still sensitive nerve endings. Thoughts of exploding hosannas followed shortly thereafter! Yes, it was that good! While we were eating our sashimi, Mr. Aoki explained to us the importance of using fresh wasabi as a condiment for sashimi. Aside from it being an excellent flavor compliment, wasabi or Japanese horseradish is known for its bacteria-killing powers, necessary when eating raw seafood. It is very easy to differentiate fresh wasabi from the artificial powder or paste. The cloying and overbearing sensation that you feel when eating artificial wasabi is replaced by a spicy, cool and smooth taste. To put it in the vernacular, it’s more “swabe”. It is unfortunate that many other Japanese restaurants do not serve fresh wasabi because of its much higher cost. Given the option, I would highly recommend ordering it. 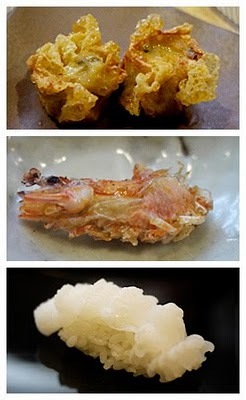 I thought that that would be the end of the Kuruma ebi, but out came the Kuruma Ebi Head deep-fried to perfection. This was a crunchy and flavorful unexpected treat. As a break from all the seafood, we were served 2 meat dishes. First up was Butano Kakuni or pork simmered in sweet sauce with some steamed vegetables. The pork was cooked to just the right amount of tenderness where it is soft to the bite but not to the point of it being mushy. The sauce had the right amount of sweetness to it. Making this dish very tasty indeed. We were then each served a slice of Pan-seared Maezawa Beef. 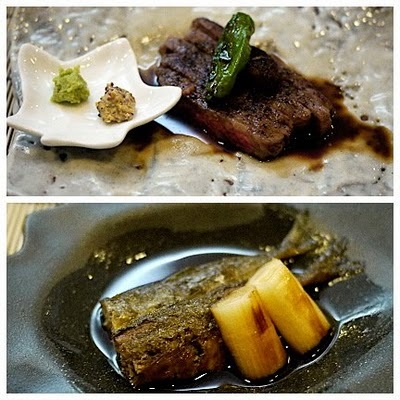 Maezawa beef belongs to the elite triumvirate of Japanese beef, the other two being Kobe and Matsuzaka. Maezawa beef comes from cows that are bred in the Iwate region of Japan. Although it is a relatively newcomer as compared to the other two, what sets it apart is that Maezawa beef can only be bought from licensed beef sellers in Japan. This ensures the buyer that he or she is buying the real thing at all times. Our serving of Maezawa beef came with some Japanese mustard and fresh wasabi. I do not suggest you use these condiments though, so that you can taste this exquisite piece of meat in all its full glory. Its buttery almost silky flavor will surely spoil you for good. Amazing! Once we were done with the meat courses, we were served our last two seafood courses. We first had Amadai Saikyoyaki or grilled “Sweet” Japanese Sea Bream with a mirin and white miso glaze. Again, this dish was perfectly grilled. Moist, flaky and delicately flavored, this was again another winner. 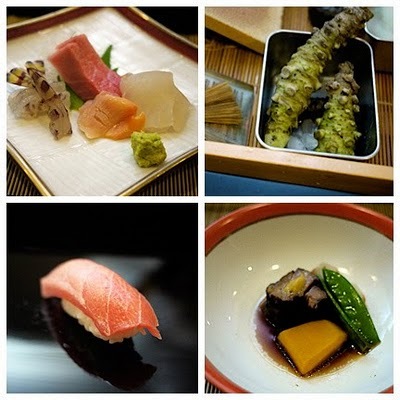 Normally, a Japanese sushi kaiseki starts with sashimi, followed by some cooked dishes in between and ends with sushi. Our meal was no different. Chef Hino-san prepared for us five extremely fresh pieces of sushi. I wanted to give you just the highlights of this course however, looking back, each piece of Sushi was unusual, and all of them stood out equally. We started with another piece of Toro, followed by Aori Ika or Japanese big fin reef squid. Then we had Botan Ebi or Japanese prawn; Uni or sea urchin roe or from Hokkaido with its distinct orange hue. Lastly, we had Anago or Saltwater Eel. Anago is tastier and more refined than the common unagi or freshwater eel that is served in other restaurants. I have to stress that these types of seafood were in season when we dined there. Choices may vary depending on the time of the year. To cap everything off we were served a piece of very sweet Japanese honeydew melon. This was a nice and wonderful end to a superb meal. I wish I could eat at Sushi Kappo as often as I want to. There are very few places in Manila that can serve and maintain a menu with such high standards. Judging from my friends’ look of hushed contentment as they sipped their green tea, makes me think that they agree with me as well. However, unless I win the lottery very soon, Sushi Kappo will be a place to go to for special occasions or at times when I want to treat myself to a special meal. Nonetheless, the fact that such a place is available to us is reason enough to celebrate. "Being a raw food enthusiast..."
Aren't you an ALL food enthusiast? Hahahaha! Good entry Sanj... Kainggit! Okay Chinkee, I admit I am an ALL food enthusiast just like you!!! Thanks for your support. I am glad that you enjoyed! Yes, I agree with you wholeheartedly. You definitely get what you pay for. Thanks for your support. Keep reading.